This morning was the first T-Ball game for my oldest boy, Timothy. This is his second year to participate in a T-Ball league, though last year we were in Plainview and there are quite a few differences between last year and this year. First of all, Timothy paid attention the entire game. 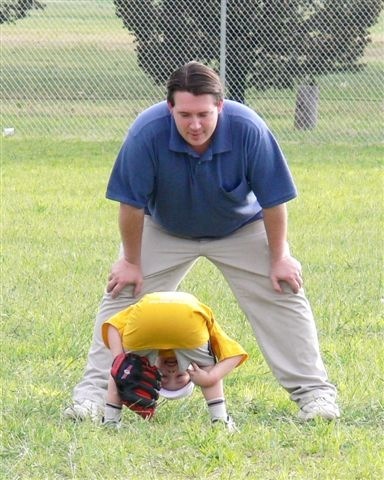 And just to refresh your memory of Timothy’s first season in T-Ball, here’s a picture of Timothy from last year. That’s still one of my favorite pictures of all time. Some may recognize it as my facebook profile pic. This year, in both innings (yes, there are only two) Timothy “made a play”. In T-Ball that means that he was able to get to the ball first and throw it to first base. Actually, he made two plays. It just so happened to be the third play and the last play of the game. For his first play, there were a number of people on the field that were helping their kids and not all of them had been at the practices so they seemed to be unaware of the rules for this version of T-Ball. Kids at this age aren’t quite ready to handle the intricacies of where to throw the ball and how to get outs. Instead, everyone bats every inning and the ball is always thrown to first base. The last batter of each team will automatically get a grand slam home run. Well, back to Timothy. The third hit was to him at third base and he was able to get the ball first. Following the instructions of many of the shouting parents, he ran to third and tagged the base, instead of just throwing it to first as he’s been instructed for the last two weeks of practice. He did what he was told and got the runner out. Apparently the announcer of the game was also uninformed because she announced the next batter was coming to the plate and there was one out in the inning. After that, I think everyone began to get the picture that the rules of baseball are over the heads of these 4 and 5 year olds. In the end, Timothy was able to get the only “out” of the game, at least the only announced out. Another difference for Timothy has been his ability to hit and throw. While he still has a long way to go on throwing while looking where he’s throwing. He’s much better than last year. Also, his hitting was much better and he hit the ball farther today that he has before, even including previous practices this year. I’m very proud of the guy. I don’t have any pictures on my camera so I am going to defer to Lori to post her pictures from the first game as well as a couple of videos. But as soon as you see the pictures you’ll see another major difference from last year. This league, or at least our team, is much more gung-ho on looking the part of baseball players. They’ve had us purchase baseball pants and socks for the team. Another parent was able to have their employer sponsor the team and buy every player a batting helmet. So, if nothing else, they look like a baseball team. Timothy’s team is called the Express, with a logo of a locomotive. His jersey number is six, which begs the question of whether he is actually number nine when he plays outfield (see picture above, HT: Joel) But the truth is, Timothy is much better at focusing on the game and the grass in the field is less interesting than the batter at the plate. One other fun note about today’s game was the opposing team’s pitcher. No, there is not really a pitcher but there is player on each team that will stand on the mound. In general, they will get the most catches since the batted ball tends to travel short of the mound. On the opposing team today, their pitcher was very funny in that he insisted on catching just about every ball and once he had caught it, he insisted on tagging out the base runner. This led to a number of tackles and chases. So, in truth, this kid probably had a lot more outs than Timothy but, still, they weren’t announced. Have I told you how proud I am of Timothy? Timothy’s coach is a computer programmer so he’s set up a website for the team, so you can visit www.fybexpress.com to keep posted on Timo’s T-ball Team.